Two police sources [said] that the incident just after 11:30 a.m. was a possible terrorist attack against the unidentified soldiers, one of whom was in critical condition. Police gunned down Couture-Rouleau, 25, in his hometown of Saint-Jean-sur-Richelieu, 30 minutes south of Montreal on Monday morning. He charged at the officers wielding a big knife with a curved handle, witnesses claim. Police fired seven bullets to stop him. Authorities had had their eye on the man since last year, they say. Couture-Rouleau became known to the RCMP after a relative alerted police to the man’s terrorist leanings… Couture-Rouleau had grown out his beard and started wearing a turban after converting to Islam a year ago. 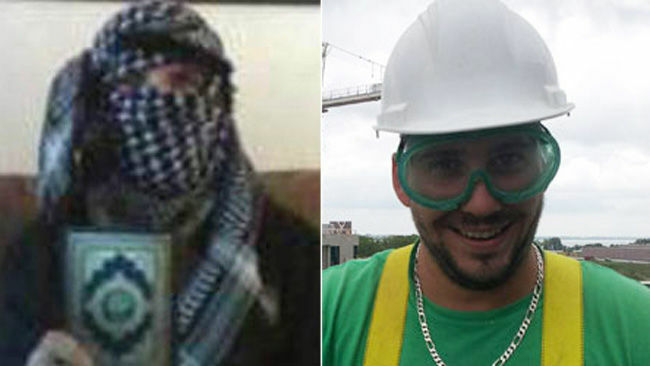 It appears that the suspect posted jihadist propaganda to the Internet under the name Ahmad Rouleau. Canada recently agreed to send six fighter jets to take part in the West’s military campaign against ISIS terrorists in Iraq, but it isn’t yet known if that was the motive for Couture-Rouleau’s attack. Guess What You Find When You Search For "Youth Pastor" in Google Images? October 21, 2014 Where Does One Even Begin Countering This Insane View of "Evil" Atheists?